The Episode starts with GST seeing Omkar with someone else, not Shivika. He asks Omkar did he get someone else. Omkar says she is Rajesh’s would be wife. GST goes to change the song. Shivika comes to Omkar. Gudiya gives them drinks. They refuse to drink. Gudiya says fine, I won’t force you to drink. Shivika says I should go home. Omkar says I will come with you. Shivika and Omkar leave from the party. They have a talk. Shivika says I wish to drink alcohol once, I don’t know what will happen after I drink, I don’t want to take this risk, so I never had a drink, its not imp that everyone’s dreams get fulfilled. He asks who can have such dreams to drink beer. She says many have such dreams. She sees Omkar gone. Omkar goes to buy beer for Shivika. He comes to Shivika and says I went to get your dream. She asks beer, really, I was joking, I can’t drink. He says I will return it then, you shouldn’t keep small wishes in heart and fulfill when you get a chance, have it when you are with Dolly, taste it once, its your wish, maybe I made a mistake. She stops him and says I can try it now, but you have to drink first and if you like it, I will drink it. He drinks and says its good. She drinks and coughs. She says its so bitter. He says you like bitter thing, leave it, you can’t drink it. She drinks more. He also drinks more. They get drunk and laugh. She says I didn’t get drunk, I remember everything, I will prove, you are Omkar, I m Shivika, we work in same bank. He says I remember everything when we met, when I saw you first in Shivratri function, when I had become Shiv and you came as Parvati, you looked so pretty, I was just seeing you. She says I was also seeing you, who is this as Shiv. He gets scared of a dog. She goes and takes the puppy. She says one should love the animals. She makes him touch the puppy. The puppy goes. Mangal and Jagat wait for Omkar. Jagat says its late. Mangal says Omkar is not a kid, I m happy that he got late. Shivika acts silly and says I didn’t dance. Omkar sys we can dance. He plays Ishq bulava song. They dance on the roads. A man rides the cycle and makes them away. She scolds the man. Omkar stops her. Devki asks Triloki to go and sleep, Shivika will come soon. Triloki worries that things can go wrong. Devki says I know Shivika well. He asks her to go and sleep. Shivika and Omkar are on the way. He acts to ride the scooty. She asks someone about the address. The man goes. She says it was my wish to go lost sometimes. She tells her silly wishes. He laughs. She says I have a big wish, I want to do a love marriage. Someone throws water on them and scolds them, calling them drunkards. They come to senses with the water splash. Shivika says I will drop you home. Omkar says I will drive. She says no, I will drive, there is no problem. They leave. She drops Omkar home. Mangal sees Omkar with a girl and rubs his eyes. He asks Jagat to come fast, Omkar has come. He shows Omkar and Shivika. Jagat says its a miracle, Omkar is with a girl. Mangal says I told you, I m happy. They wish the girl doesn’t leave Omkar. Shivika leaves. Omkar smiles. Shivika comes home and sees Triloki. She goes in. Omkar asks what did you say about love marriage. Shivika gets down his bike and says I should have not told this. He stops the bike and meets with an accident. She jumps into the river. Triloki scolds Shivika. 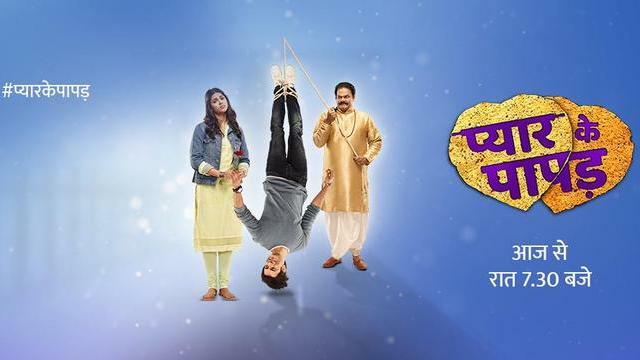 The post Pyaar Ke Papad 9th March 2019 Written Episode Update: Omkar and Shivika live free appeared first on Telly Updates.